Why are we still using cash? That’s the question posed in a recent episode of Freakonomics Radio. Created by New York Times best-selling authors Steven D. Levitt and Stephen J. Dubner, the award-winning podcast blends economics and pop-culture to explore the “hidden side of everything”. In typical Freakonomics fashion, this episode digs deep into a range of economic questions about the role of cash in society and uncovers numerous pitfalls along the way. Banking with no hidden fees. No monthly fees. No overdraft. No minimum balance. 38,000+ fee-free ATMs. He’s right. There’s no shortage of non-cash payment options these days including debit and credit cards, p2p payment services like Venmo, Square Cash, and Chime’s Pay Friends, and now Bitcoin. But even with all of these options, we’re a long way from a truly cash-free society. Until we reach that point, you’ll need to be prepared for those moments when cash is required (I’m looking at you, food trucks). Knowing how to avoid ATM fees will help you keep more cash and never pay a bank fee again. Go to ATMs within your bank’s network. The best way to avoid ATM fees is to know your bank’s network. Most banks have thousands of in-network ATMs available and with a bit of planning ahead, you can always get cash for free at one of these locations. For example, Chime’s ATM Finder helps our members find nearby fee-free ATMs at 24,000+ locations across the U.S. That’s larger than the fee-free ATM networks at Chase, PNC, Bank of America, CitiBank, or Wells Fargo. Skip the ATM. Use your debit card to get cash back at stores. Most grocery stores, pharmacies, and even big box stores like Target, Walmart, and Costco allow you to get cash back if you use your debit card at the time of purchase without an extra fee. When you’re shopping at one of these locations, take advantage of the opportunity to get some extra cash. Be sure to confirm that you can avoid ATM fees by asking the clerk and by reviewing the card reader at checkout. Chime’s ATM finder also allows you to locate over 30,000+ cash back locations where you can take out cash fee-free with a purchase. Use your debit card for group expenses in exchange for cash. We’ve all been in this situation: you’re out for a meal with a group of friends, the check comes and you either have to split the bill between a stack of cards or some people have to pay cash. This is a great opportunity for you to help simplify the group payment process and get some cash. Offer to put the full bill on your card and pocket the cash your friends contributed. Avoid ATM fees and be the most popular friend at the table! Don’t use cash unless you absolutely must. It’s a good practice to always carry cash. But that doesn’t mean you always have to use it. In fact, you should treat it like an emergency fund. Instead, use your debit card for everything, even small purchases, so you can keep the cash handy for times when you have no other option. When you do need to dip into your cash, proactively replenish the bills next time you’re able to get more cash with one of the fee-free options above. There are other reasons to avoid paying with cash. When you pay for all of your expenses with your debit card, you’ll have the added benefit of a transaction history for all of your spending. 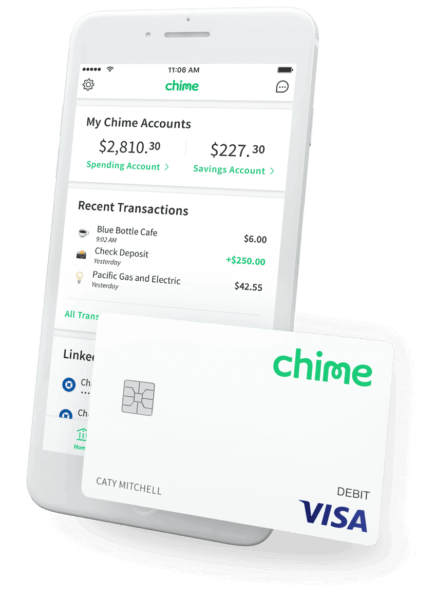 Even better, if you’re a Chime member enrolled in Automatic Savings, paying with your Chime Visa® Debit Card rather than cash also means more money in your Savings Account. Once you’ve enrolled, each time you use your Chime card to make a purchase, you’ll save money automatically. Plus you’ll earn a 10% cash bonus on your weekly round-ups every Friday. Will we ever live in a cashless society? Possibly, but until then these simple steps can help you avoid ATM fees and keep cash on hand when you need it.